There are many touching, heartwarming stories of “service” dogs who do amazing things to help their disabled people. At one time we thought of them mainly as seeing-eye dogs, but it’s gone way beyond that by now. There are dogs working alongside soldiers in rehab centers who are recovering from injuries of all kinds, physical and mental. Dogs who can sense when someone is about to have an epileptic seizure and alert them to get into a safe position. Dogs who can call 911 in an emergency. But one of the most remarkable stories ever was in the New York Times Magazine this weekend. It tells of Iyal, a boy who was adopted from an orphanage in Russia by a family in Roswell, Georgia. Iyal turns out to have severe developmental problems, and is diagnosed as suffering from fetal alcohol syndrome. His birth mother’s alcoholism had damaged the boy’s brain. Iyal Winokur was intellectually impaired and at high risk for a range of secondary disabilities, including poor judgment, impulsive behavior, social isolation, limited academic achievement, unemployment, drug and alcohol abuse, imprisonment, mental-health problems including suicidal ideation, inability to live independently and inappropriate sexual behavior. Few medications or therapies could be recommended as truly effective. His parents struggled to cope with Iyal’s flare-ups. He required round-the clock care and attention. His mother, Donnie Winokur, put her career on hold to look after him. Iyal often babbled a nonstop stream of senseless chatter and baby talk. He required a full-time aide at school and his mother’s undivided attention in the house. Staying in love with him has been trickier. People with brain injuries aren’t able to reciprocate love in the ways you expect. You’re struggling with this cluster of emotions toward your child — love, but also anger, bewilderment, resentment, frustration and yearning. Then someone suggested getting a service dog. Donnie’s husband, Rabbi Harvey Winokur, was skeptical. “Thousands of dollars for a dog?” he cried. “Instead of for a nanny, or respite care, or a private school? Does that make sense? A dog’s not going to mean anything to Iyal.” Donnie persuaded him. 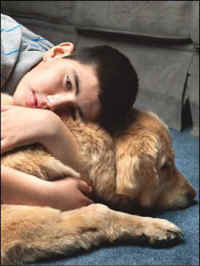 Chancer, a golden retriever, had already been a service dog in the home of a person who ended up unable to care for him. The Winokurs brought him home. The morning after Chancer’s first night in the house, the Winokurs woke up after a full night’s sleep for almost the first time since 1999. They looked at each other in semi horror: was Iyal still alive? They found him snoozing beside the big yellow dog, the latter hogging the mattress. Since Chancer’s arrival in the house, they’ve rarely been disturbed in the night. Iyal may still wake up, but he’s evidently reassured by the dog’s presence and returns to sleep. And so the story continues. Chancer doesn’t just follow his training; he has an intuitive knowledge of what to do and when. Iyal rages by crossing his arms, sitting down hard on the floor and screaming and kicking. Chancer unknots the crossed arms by inserting his wide muzzle through the locked arms from below, opening them up and nuzzling toward Iyal’s face, licking and slobbering, until the boy’s screams turn to tears of remorse or to laughter. And if he senses that Iyal is becoming stressed in one of his sessions with a therapist, Chancer intervenes. Chancer moves between the visitor and the boy, clearly relaying: We’re done for today. He senses Iyal’s mood changes even if he’s not in the same room. Chancer moves between the visitor and the boy, clearly relaying: We’re done for today. From two floors away, he will alert, flicking his ears, tuning in. Sensing that Iyal is nearing a breaking point, he gallops up or down the stairs to find him, playfully head-butts and pushes him down to the floor, gets on top of him, stretches out and relaxes with a satisfied groan. Helplessly pinned under Chancer, Iyal resists, squawks and then relaxes, too. The big dog lies on top of the boy he loves, and seals him off from the dizzying and incomprehensible world for a while.